Technology has improved dental care in a variety of ways. With dental implants, for instance, we can provide you with strong and sturdy tooth replacement. With digital X-rays, we can improve your overall experience in the dental office and keep better track of your health. With CEREC one-visit crowns, we can design and craft your custom-made porcelain crowns, inlays, and onlays right here in our Castle Rock dental office, performing the entire restorative process in a single visit. When your smile has been damaged and you need a crown, inlay, or onlay, consider CEREC one-visit crowns from Cowlitz River Dental. Our office can use CEREC one-visit crowns technology to create beautiful porcelain dental restorations, making this a popular choice for patients needing crowns. For decades, it’s taken a minimum of two visits to complete the process of creating and placing porcelain crowns. 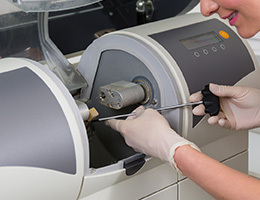 The computerized CEREC technology creates a 3D image of the tooth to be restored, and this image is used to design your crown. Once the design is complete, the CEREC milling unit shapes a block of porcelain into your crown. We then place the crown, and in just about 90 minutes, your CEREC one-visit crown procedure is all done! The CEREC one-visit crowns have been shown to provide phenomenal strength and excellent aesthetic results. What are the benefits of CEREC one-visit crowns from Cowlitz River Dental in Castle Rock, WA? Less time in the dental office – only one appointment! Everyone loves convenience, but everyone also loves quality and beauty. With CEREC one-visit crowns, you can have all three. Most people will require a dental restoration of some kind during their lifetimes. Few people manage to maintain perfect, damage-free smiles forever. There’s no need to worry, though, if you’ve broken a tooth or have extensive decay. With restorative dentistry procedures like CEREC one-visit crowns, Cowlitz River Dental can help. Contact us today to schedule a consultation.